1.1 I have some currency that was damaged. My bank will not exchange it for undamaged currency. What can I do? 1.2 How do I purchase sheets of uncut paper currency through the mail? 1.3 Does the Treasury Department sell shredded paper currency? Where can I buy it? 1.5 I have a $1,000 currency note from the Bank of the United States. It is dated December 15, 1840 and has the serial number "8894." Can you tell me what it is worth now and where I can cash it in? 1.6 I have some old silver certificates. How can I trade them in for silver dollars? 1.7 I have some old gold certificates and would like to trade them in for gold. What should I do? 2.1 What denominations of currency are in circulation today? Will any new denominations be produced? 2.2 What was the highest denomination of United States currency ever produced? 2.3 What denominations of currency notes is Treasury Department no longer printing? 2.4 Did the Treasury Department ever produce $1 million currency note? I have one I want to know about. 2.5 Why did the Treasury Department remove the $2 bill from circulation? 2.6 What is a star note? 3.1 I thought that United States currency was legal tender for all debts. Some businesses or governmental agencies say that they will only accept checks, money orders or credit cards as payment, and others will only accept currency notes in denominations of $20 or smaller. Isn't this illegal? 3.2 What are Federal Reserve notes and how are they different from United States notes? 3.3 What are United States Notes and how are they different from Federal Reserve notes? 4.1 Why were certain individuals chosen to be pictured on our paper currency? 4.2 What portraits are found on United States paper currency that is in circulation today? Whose portraits were included on currency notes that are no longer produced? 4.3 What is the significance of the symbols on the back of the one-dollar bill? I'm particularly interested in the eye and the pyramid. 4.4 What is the significance of the series date on our currency? Doesn't the date change each year as it does with coins? 4.5 What States are shown on the back of the five-dollar bill? 4.6 What make and model of cars are shown on the ten-dollar bill? 4.7 Is the Treasury Department going to change the designs on our paper money? 5.1 How much paper currency does the Treasury Department print every day? Where is it printed? 5.2 What can you tell me about the paper that is used to make our currency notes? I'm also interested in the size and weight of the notes. 5.3 Why are United States paper currency notes printed using green ink? 5.4 I believe that the Treasury Department should add braille markings to our currency to help the visually impaired. Are there any plans to do this? 5.5 Can the Treasury Department produce a special series of currency to honor a distinguished person or special event? This is done frequently with our coins. 5.6 How much does it cost to produce US currency and paper money? 6.1 What is my bill worth? 6.2 What books or magazines can I buy that will tell me the value of my currency? You will be interested to know that the Bureau of Engraving and Printing (BEP), through its Office of Currency Standards, processes all reimbursement for damaged United States currency. They decide the redemption value of torn or otherwise unfit currency by measuring the portions of the notes submitted. Generally, they reimburse the full face value if clearly more than one-half of the original note remains. Currency fragments measuring less than one-half are not redeemable. If you feel that the currency you have clearly meets these standards, then you should forward it to the Department of the Treasury, Bureau of Engraving and Printing, Office of Currency Standards (OCS), Room 344-PD, Post Office Box 37048, Washington, D.C. 20013. You can now also visit the OCS on-line to get complete information about handling unfit currency notes. Upon receipt, the OCS will examine the currency to decide its authenticity and suitability for redemption. They will notify you directly of their findings. Unfortunately, it is impossible to predict how long this procedure will take, due to varying workloads. However, they make every effort to speed up shipments when possible. The Bureau of Engraving and Printing (BEP) operates a mail order division and has been selling uncut sheets of currency through the mail since October 26, 1981. In addition, the BEP participates in numismatic and philatelic shows located throughout the country where they offer uncut currency for sale. You can now access the BEP store and purchase several currency related products. Many sellers on eBay also offer uncut currency for sale. Yes. The Bureau of Engraving and Printing (BEP) destroys currency notes that are found to be imperfect during the printing process. The BEP packages small bags of shredded currency from the destroyed new currency, and sells these bags as mementos to visitors at the BEP's Washington, DC and Fort Worth, TX Visitor Centers. The BEP also sells five pound bags of shredded currency through the mail. Orders can be placed on the BEP's website or by calling 1-800-456-3408. The Federal Reserve System destroys worn currency notes at some of its various banks located throughout the country. Shredded currency is available only from certain Federal Reserve Banks. They sell it only under contract to buyers who will purchase the entire residue for at least a one year period. It is not readily available for distribution or for sale in small quantities to individuals because of operational difficulties and excessive administrative work for Federal Reserve Banks. The Treasury Department approves the use of shredded currency in certain circumstances. One permitted use is recycling it (mixing it with other materials) to form a useful manufactured product such as roofing shingles or insulation. In addition, the shredded currency may be placed in firmly sealed containers as novelty items like pens, ornaments and jewelry. However, the Treasury will allow companies or other parties to sell the shredded currency in its original form or where it is readily not recoverable. 1.4 I have an old currency note. Can you tell me what it is worth? I would like to sell it. Many sources are available to help you value an old currency note. Use our United States Currency Price Guide for a quick approximation of value. For additional resources, please see our books/magazines page and our links to currency dealers. Currency dealers and collectors consider the condition, series date, denomination, production totals, and other factors when evaluating currency notes to figure out their numismatic value. Each note is different from every other. In addition, grading is not an exact science, varying from dealer to dealer. Therefore, it is possible to have the same note appraised at significantly different values. There is sometimes a wide range (both above and below the market price) in the values quoted when buying and selling currency notes. This also may be due to the dealer's current inventory and the availability of similar notes in the marketplace. Another great resource for accurate pricing is searching eBay's Paper Currency category for complete auctions similar to your bill. Our value estimator is meant only to be a general reference for commonly encountered United States notes and is no way meant to be an exhaustive price guide. Like many collectibles, there are many particulars that can have a significant effect on value. We've attempted to show a sampling of realistic values such as you might find on eBay. However, when buying or selling, we advise you research carefully, consult experts when possible, and do not rely solely on this guide. No guarantee is made as to its accuracy. Please note papermoneyguide.com does not buy or sell currency. Currency notes from the Bank of the United States are something that we have seen many times. It is important to note, first, that the Treasury Department did not issue notes intended for circulation as currency until 1862. This being the case, these notes are not obligations of the United States Government. You may be interested in a brief history of the Bank of the United States. Our research has shown that the "first" Bank of the United States was founded in 1791 and existed until 1811; the "second" bank operated from 1816-1836. The United States Government held 20 percent of the Bank stock, named five of the 25 trustees, and granted the charter to the Bank. In 1836, however, President Andrew Jackson vetoed a bill to renew the Bank's charter, withdrew United States Treasury funds from the Bank, and ceased all United States Government involvement in the Bank's operations. In 1837, the trustees of the Bank secured a charter from the State of Pennsylvania. Then, they paid the United States Government for its outstanding interest and swapped old stock for new stock on a one-to-one share basis. The Bank's name changed to the Bank of the United States of Pennsylvania. After 1837, the history of the Bank was very rocky. On February 4, 1841, the Bank closed its doors. This action left many creditors, including the London Merchant Bank, Baring Brothers, and the Rothschild family, with over $25 million in claims. They were lucky to receive one-third value for their claims. Because the Treasury Department did not issue these notes, they have no way of verifying their authenticity or figuring out their value. It is likely, though, that the is part of a series of antiqued reproductions issued in various denominations and forms for use in advertising campaigns. The most popular of these bear the serial number 8894. These notes are so widespread that they were the subject of an August 5, 1970, article in COIN WORLD. On March 25, 1964, C. Douglas Dillon, the 57th Secretary of the Treasury announced that silver certificates would no longer be redeemable in silver dollars. This decision was pursuant to the Act of June 4, 1963 (31 U.S.C. 405a-1). The Act allowed the exchange of silver certificates for silver bullion until June 24, 1968. This was the deadline set by the Congress. Since that date, there has been no obligation to issue silver in any form in exchange for these certificates. You may be interested to know that the Congress took this action because there were approximately three million silver dollars remaining in the Treasury Department's vaults. These coins had high numismatic values, and there was no way to make an equitable distribution of them among the many people holding silver certificates. Silver certificates are still legal tender and do still circulate at their face value. Depending upon the age and condition of the certificates, however, they may have a numismatic value to collectors and dealers. The present denominations of our currency in production are $1, $2, $5, $10, $20, $50 and $100. The purpose of the United States currency system is to serve the needs of the public and these denominations meet that goal. The present currency in circulation satisfies the public at large, and the Bureau of Engraving and Printing (BEP) has no plans to change the denominations in use today. Denominations greater than $100 ceased production in 1969. 2.2 What was the largest currency denomination ever produced? The largest denomination of currency ever printed by the Bureau of Engraving and Printing (BEP) was the $100,000 Series 1934 Gold Certificate featuring the portrait of President Wilson. These notes were printed from December 18, 1934 through January 9, 1935 and were issued by the Treasurer of the United States to Federal Reserve Banks only against an equal amount of gold bullion held by the Treasury Department. The notes were used only for official transactions between Federal Reserve Banks and were not circulated among the general public. To view samples of high demonination currency, view these listings on eBay. 2.3 What denominations of currency notes is the Treasury Department no longer printing? On July 14, 1969, David M. Kennedy, the 60th Secretary of the Treasury, and officials at the Federal Reserve Board announced that they would immediately stop distributing currency in denominations of $500, $1,000, $5,000 and $10,000. Production of these denominations stopped during World War II. Their main purpose was for bank transfer payments. With the arrival of more secure transfer technologies, however, they were no longer needed for that purpose. 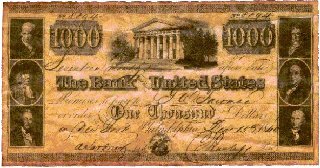 While these notes are legal tender and may still be found in circulation today, the Federal Reserve Banks remove them from circulation and destroy them as they are received. To view samples of high demonination currency, view these listings on eBay. 2.4 Did the Treasury Department ever produce a $1 million currency note? I have one that I want to know about. The United States has never issued a $1 million note. While you may find one in circulation or selling on the internet, they are not official United States currency notes manufactured by our Bureau of Engraving and Printing (BEP). As such, they are not redeemable by the Department of the Treasury. Most are simply collectibles or novelty items produced to celebrate an occasion or make a political statement. Such bills do not assert that they are legal tender. However, the Federal Reserve has declared them legal to print or own because they are not infringing on a genuine issue of US currency. Contrary to the impression of many people, the Treasury Department did not stop circulating the $2 bill. On September 12, 1996, Robert E. Rubin, the 70th Secretary of the Treasury, was presented with a new series $2 bill. The Series 1995 notes were printed at the Bureau of Engraving and Printing's (BEP) Western Currency Facility and bear the seal of the Federal Reserve Bank of Atlanta. The $2 bill remains one of our circulating currency denominations. According to BEP statistics, 590,720,000 Series 1976 $2 bills were printed and as of February 28, 1999, there was $1,166,091,458 worth of $2 bills in circulation worldwide. The key for successfully circulating the two-dollar bill is for retailers to use them just like any other denomination in their daily operations. In addition, most commercial banks will readily supply their retail customers with these bills if their customers request them in sufficient volume to justify stocking them in their vaults. However, neither the Treasury Department nor the Federal Reserve System can force the distribution or use of any denomination of currency on banks, businesses or individuals. A star note is a note with a "*" in the prefix or suffix of the serial number. A Star Note is typically used as a replacement for a note found to be defective or otherwise damaged during the printing process to maintain the correct number of notes in a specific print run. Because Star Notes are replacements for errors made in the printing process, they are much more uncommon than "normal" notes, and are therefore popular with collectors. To find star notes, browse eBay listings. Federal Reserve Banks obtain the notes from the Bureau of Engraving and Printing (BEP). It pays the BEP for the cost of producing the notes, which then become liabilities of the Federal Reserve Banks, and obligations of the United States Government. As with our nation's coinage, the Secretary of the Treasury usually selects the designs shown on United States currency. Unless specified by an Act of Congress, the Secretary generally has the final approval. This is done with the advice of Bureau of Engraving and Printing (BEP) officials. In addition, the Commission on Fine Arts reviews all of the designs. The law prohibits portraits of living persons from appearing on Government Securities. Therefore, the portraits on our currency notes are of deceased persons whose places in history the American people know well. The basic face and back designs of all denominations of our paper currency in circulation today were selected in 1928, although they were modified to improve security against counterfeiting starting in 1996. A committee appointed to study such matters made those choices. The only exception is the reverse design of the one-dollar bill. Unfortunately, however, BEP records do not suggest why certain Presidents and statesmen were chosen for specific denominations. United States currency notes now in production bear the following portraits: George Washington on the $1 bill, Thomas Jefferson on the $2 bill, Abraham Lincoln on the $5 bill, Alexander Hamilton on the $10 bill, Andrew Jackson on the $20 bill, Ulysses S. Grant on the $50 bill, and Benjamin Franklin on the $100 bill. There are also several denominations of currency notes that are no longer produced. These include the $500 bill with the portrait of William McKinley, the $1,000 bill with a portrait of Grover Cleveland, the $5,000 bill with a portrait of James Madison, the $10,000 bill with a portrait of Salmon P. Chase, and the $100,000 currency note bearing a portrait of Woodrow Wilson. The eye and the pyramid shown on the reverse side of the one-dollar bill are in the Great Seal of the United States. The Great Seal was first used on the reverse of the one-dollar Federal Reserve note in 1935. The Department of State is the official keeper of the Seal. They believe that the most accurate explanation of a pyramid on the Great Seal is that it symbolizes strength and durability. The unfinished pyramid means that the United States will always grow, improve and build. In addition, the "All-Seeing Eye" located above the pyramid suggests the importance of divine guidance in favor of the American cause. The inscription ANNUIT COEPTIS translates as "He (God) has favored our undertakings," and refers to the many instances of Divine Providence during our Government's formation. In addition, the inscription NOVUS ORDO SECLORUM translates as "A new order of the ages," and signifies a new American era. Each time the design on our paper currency notes changes, a new series date appears on the face of the bill. This shows the year that the design change occurred. The series date on currency notes does not change each calendar year as it does on coins, but only when there is a major revision in the basic design. The capital letter following the series year shows that a minor design change was authorized in a particular series. Such a change occurs after the appointment of a new Secretary of the Treasury or Treasurer of the United States. At this time, the signature(s) found on the notes also change. A change in only one signature is a minor revision. The vignette on the reverse of the five-dollar bill depicts the Lincoln Memorial. You may be aware that, engraved on that Memorial are the names of the 48 states in 1922, which was the year the Memorial was dedicated. There are engravings of 26 State names on front of the building, which appears on the note vignette. As a result, only 26 of the States appear on the note. The upper frieze of the Memorial bears the States of Arkansas, Michigan, Florida, Texas, Iowa, Wisconsin, California, Minnesota, Oregon, Kansas, West Virginia, Nevada, Nebraska, Colorado, and North Dakota. The lower Frieze lists the States of Delaware, Pennsylvania, New Jersey, Georgia, Connecticut, Massachusetts, Maryland, Virginia, and New York. In addition, the engravings show the abbreviated names "Hampshire" (for New Hampshire) and "Carolina" (for South Carolina). We have no information why the prefixes for these states were not used. Most people are now aware that the Bureau of Engraving and Printing (BEP) issued newly-designed currency notes beginning in 1996. The current design effort is a response to the need to anticipate potential problems with counterfeiting and to prevent criminals from abusing United States paper currency. Research for counterfeit deterrent features is a continuing process that has already resulted in two recent features being added. These features are not readily visible to the naked eye. Specifically, there is an embedded polyester thread identifying the denomination, and microprinting around the portrait on the face of the note. Neither of these recent changes altered the appearance of our paper currency. The thread is visible with the naked eye, but only if you hold the note up to a light source. The microprinting is visible only under a magnifying glass. These features cannot be picked up by a copying machine. This is how many counterfeiters produce currency notes today. The Treasury Department has historically continued to honor previous designs of our currency. Furthermore, the Department has never recalled currency when introducing a new design. There are billions of dollars in U.S. currency circulating worldwide. Any new design, when issued, would enter circulation in a deliberate and organized way, avoiding any recall or exchange. This will ensure the continued confidence of people in the value of the U.S. currency they now possess. The Bureau of Engraving and Printing (BEP) headquarters is located in Washington, DC. The BEP is responsible for designing and printing our paper currency. There is also a satellite production facility located in Fort Worth, Texas, which began operations in January 1991. The BEP produced approximately 37 million currency notes each day with a face value of about $696 million, and 45 percent of these notes are the $1 denomination. About 95 percent of the currency notes printed each year are used to replace notes that are already in circulation. The paper that the Bureau of Engraving and Printing (BEP) uses to produce our currency is "distinctive." Crane & Co. produces it according to BEP specifications. It is composed of 75 percent cotton and 25 percent linen. The paper also contains red and blue fibers of various lengths that are evenly distributed throughout the paper. All denominations of paper currency notes printed since 1929 are the same size, measuring approximately 2.61 inches (6.63 centimeters) by 6.14 inches (15.60 centimeters). Each note is 0.0043 inches thick, and a stack of currency notes one mile high would contain over 14.5 million notes. If all of the currency notes printed were laid end to end, they would stretch around the earth's equator approximately 24 times. Each currency note, regardless of its denomination, weighs about one gram. There are 454 grams in one U.S. pound, so there should be 454 notes in a pound. The BEP has researched this question and found some evidence to support the following explanation. It appears that the growing popularity of bank notes and the development of photography in the mid-1800s forced currency production changes. It was customary to print the currency notes in black combined with colored tints as a deterrent to counterfeiting. Early cameras saw everything in black and features that were distinguishable on a note by color variant lost their individuality when reproduced photographically. However, counterfeiters soon discovered that it was easy to remove the colored inks used then from a note without disturbing the black ink. In other words, a counterfeiter could erase the colored portion, photograph the black ink, and then make the desired number of copies. They then would overprint the copies with an imitation of the colored ink. The solution to this problem was in the development of ink that counterfeiters could not erase without adversely affecting the black coloring. After the development of such an ink product, Tracy R. Edson purchased the patent rights. He was a co-founder of the American Bank Note Company. This was one firm that produced the first paper money issued by the United States. The companies printed the faces of these and other early notes under contract with a green tint, presumably of the protective ink. When printing with oil-base inks, such as the "patent green," it is not unusual for the color to strike through to the opposite side of a sheet. It is possible that they used a darker shade of the ordinary green for the backs of the early currency notes to make the tine "strike through" less obvious. The transition of printing money exclusively at the BEP was gradual. They probably printed the backs of the notes during the transition period in green simply to make all the currency a uniform color. Once the BEP was on full-scale production, there was no reason to change the traditional color and this practice remains to this day. You may be aware that over the years, the Congress considered several legislative initiatives to incorporate such features in United States currency. However, it never enacted any of them into law. Also, our Bureau of Engraving and Printing (BEP) has conducted several reviews in the past of our currency system. They evaluated the incorporation of Braille symbols and/or other design features into currency to help the visually impaired. We understand that the National Academy of Sciences and the Committee on Currency Features for the Visually Impaired have also studied this question. In these studies, individuals evaluated features that could be incorporated in the production of United States currency notes that would enable blind and visually disabled people to more easily determine the denomination of a note. Previous studies surrounding this issue suggested that several modifications were possible, including Braille dots, raised symbols, cutting corners, producing notes of different sizes, or with perforations. The studies have shown that the durability of these modifications is limited. Research into features to help the blind will continue. You may be interested to know that the Series 1996 $50, $20, $10 and $5 currency notes include a large dark numeral on the back of the note that will help millions of people with low vision to identify the denomination of their currency. Officials in the Treasury Department and our Bureau of Engraving and Printing (BEP) appreciate the spirit of helpfulness of persons who suggest that we commemorate noteworthy persons or events on United States currency notes. Adopting such a suggestion at this time is unlikely because carrying out a proposal for a special currency issue requires spending several hundred thousand dollars for the necessary additional printing and processing equipment. It would also require increased costs for examining and handling operations and would require changing both the obverse and reverse sides of the currency, along with preparing new printing plates. 5.6 How much does it cost to produce US currency? The following is a VERY BASIC chart of approximate prices for common small size notes. Please note that there are various exceptions to this chart including star notes, fancy serial numbered notes, error notes, signature combinations, and certain other rarities. This chart is by no means meant to be an exhaustive valuing system, but rather a quick reference for non-collectors who wish to find an approximate value for their bills. When buying or selling, we suggest that you research your transaction thoroughly. Still can't find an answer to your question? Have a FAQ that belongs here? Please send it to us. Many FAQ items on this page courtesy U.S. Treasury. PaperMoneyGuide.com takes reasonable measures to ensure the quality of the data and other information made available on this Web site. However, PaperMoneyGuide.com makes no warranty, express or implied, nor assumes any liability or responsibility for the accuracy, timeliness, correctness, completeness, merchantability, or fitness for a particular purpose of any information that is available through this Web site.